Mussel farmers in Canada are having problems with sea squirts. 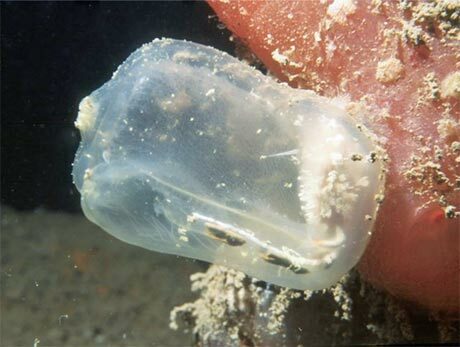 A sea squirt (more properly called a tunicate) is a marine animal that looks like a little soft vase. In the wrong place they can cause massive economic damage with around 63% of the mussel harvest lost. Scientists at Fisheries and Oceans Canada researching the problem are using Windmill Software to help with their investigations. A tunicate sticks itself to a hard surface, which are scarce in the mussel farming areas. Longline mussel farming gear and the mussels themselves, though, provide perfect attachment points for these invasive species. This causes the mussel farmers two headaches: during harvesting additional labour is needed to remove the tunicates from the mussels and, more importantly, they cause considerable crop loss. The farmers grow the mussels on many 2 m long polyethylene sleeves or socks attached to long lines. Over 4000 tunicates can infest just one of these sleeves. The weight of the tunicates breaks the mussels hold on the lines and they fall to the bottom where they can't be harvested. Another problem faced by the mussels is the competition for food from the tunicates. Mussels obtain all of their nutritional requirements naturally from the sea without additional feeding by farmers. Both the mussels and the tunicates eat phytoplankton (microscopic plant-like organisms). The scientists - Luc A. Comeau, Ramon Filgueira, Thomas Guyondet and Remi Sonier - are looking into how the presence of tunicates affected the food available to the mussels. In the laboratory the researchers set up tanks of mussels and tunicates. To determine how much phytoplankton was in the water they measured the fluorescence of chlorophyll. To do this they connected a fluorometer (CYCLOPS-7 submersible sensor from Turner Designs) to a Microlink 751 data acquisition controller and used Windmill Software to collect the data. Windmill logged readings and provided a near real-time (5 second delay) graphical display of fluorescence. After an hour the researchers stopped the flow of water and monitored the exponential decline in fluorescence over time on the computer screen. The scientists found that at non-infested sites the demand for phytoplankton was less than the ecosystems renewal capacity. Where tunicates colonise mussel sleeves though, phytoplankton demand could outpace supply. The tunicates take more of the pico-phytoplankton (the smallest phytoplankton) than the mussels and quickly grow and multiply. Windmill software's low-cost data acquisition system helped the researchers conclude that when mussel sleeves are fouled with tunicates there is a significant alteration in the demand for food particles. The multi-function nature of the system means that the Microlink hardware and Windmill software can be used in many future research projects - interfacing all sorts of different instruments and sensors to a computer. Comeau, Luc A., et al. "The impact of invasive tunicates on the demand for phytoplankton in longline mussel farms." Aquaculture 441 (2015): 95-105.